Not all foods from our childhood are created equal. For every successful product, there was a one-hit wonder that disappeared as soon as we hit puberty. 3. Tivoli Ice Cream Bar. 6. 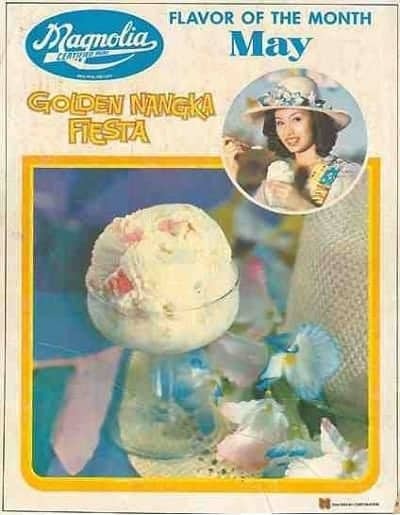 Magnolia’s Golden Nangka Fiesta Ice Cream. 7. Nestlé Non-Stop Ice Cream. 10. Magnolia Chocolait (in bottles). 14. Coney Island Ice Cream. Chocobot is best remembered as the brave candy brand who tried–but failed–to dethrone Choc Nut as Philippines’ favorite chocolate. 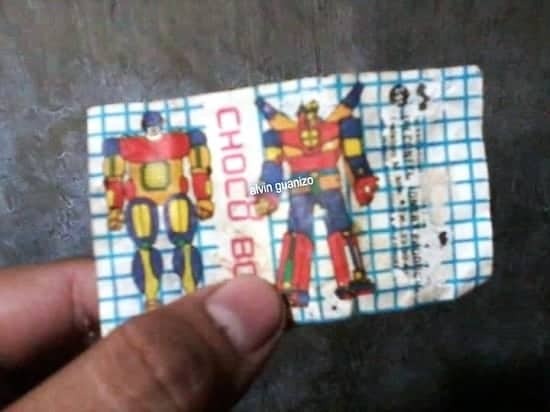 Kids from the ’90s would swarm nearby sari-sari stores to have a handful of Chocobot, famous for its Transformers-inspired packaging. Not only did we buy it to taste the signature chocolate-peanut candy, but also to (hopefully) win a raffle of some sort. Remember the “Better Luck Next Time!” printed inside its wrapper? We never figured out what the mystery prize was because Chocobot soon vanished without a trace. Royal Sparkling Soda was born when San Miguel Brewery first ventured into the production of non-alcoholic, carbonated beverages. Also known as carbonated water, a sparkling soda is made by dissolving carbon dioxide in water. The chemical reaction produces a bubbly water which creates an illusion that it “sparkles,” hence the name. 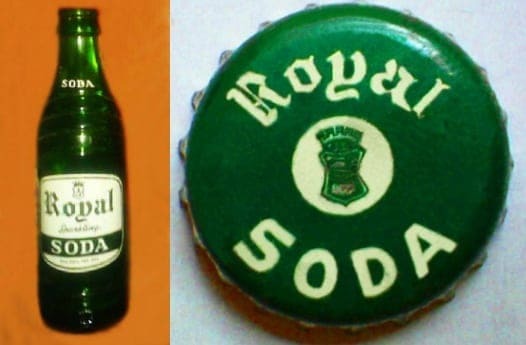 In the 1940s, Royal Sparkling Soda—advertised as “perfectly carbonated pure mineralized water”—came in green bottles shaped like bowling pins. Over the next decades until the product’s demise, the soda bottle transformed both in terms of design and color—from green to clear and back to green again. In its heyday, Tivoli was known as the “ice cream ng masa” because of its affordability. It became the staple of our childhood summer merienda and we didn’t care if it dripped onto our school uniform as long as we enjoyed its creamy goodness. Manufactured by Consolidated Foods Corporation (which later merged with John Gokongwei’s Universal Robina Corporation), Tivoli ice cream was made from the only ISO-certified ice cream plant in the Philippines. The brand suffered lack of innovation and several disputes with suppliers and dealers. In the end, the cost of the ice cream skyrocketed while its supply dwindled, giving the brand’s international counterparts an opportunity to dominate the local ice cream market. If you’re looking for one of the most, if not the most, unpopular soft drinks in the history of local soft drinks, look no further than Yes Cola. 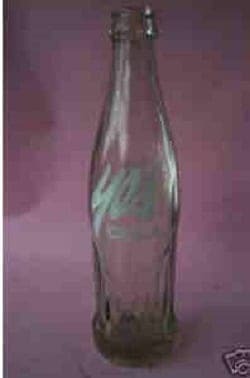 However, the thing that made it notorious also made this now-defunct soda brand memorable. So what’s wrong with Yes Cola? As some of the ‘60s and ‘70s kids would recall, each bottle of Yes Cola cost 15 cents. And as they always say, you get what you pay for. The locally-made soda, unlike other more popular brands, had a weird aftertaste. Its variant, the Apple Sidra soft drink, had the same issue: some displeased customers said it tasted like gasoline! In 2006, the popular fast food chain McDonald’s added an East-meets-West product on its menu. They christened it “McRice Burger” and soon hit the stores in Taiwan and Singapore before being launched in the Philippines. 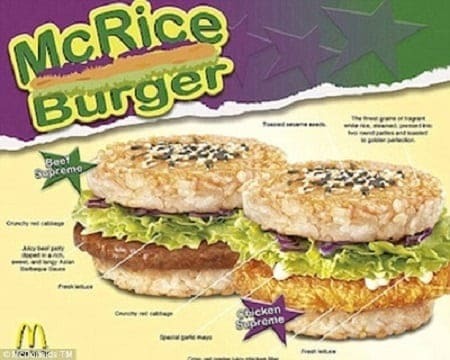 McRice Burger was based on the idea of creating a rice meal that Asians would enjoy anywhere without the use of utensils. Rice patties, which served as hamburger buns, were made from fragrant white rice. They were toasted to perfection and topped with black and white sesame seeds for that extra aroma. McRice Burger came in two variants: Beef Supreme and Chicken Supreme. Some consumers welcomed the idea; Filipinos, after all, won’t survive a day without eating rice. Sadly, they were outnumbered by those who thought it was a lame alternative to a regular rice meal, pushing the burger to the ever growing list of discontinued McDonald’s products in the Philippines. If there’s one thing that could explain Magnolia’s staying power, that would be its innovative ice cream flavors. In 1954, for example, the company launched the popular “Flavor of the Month” which, as the name suggests, introduced a different ice cream flavor every month to its Filipino consumers. The ice cream flavors born during this era ranged from the traditional to downright exotic: Chico, Choco Pretzel, Sweet Corn, and Banana Split, among others. Another memorable flavor was the Golden Nangka Fiesta which combined fruit salad and langka (jackfruit) to create a mouth-watering dessert ideal for fiestas and other special occasions. Magnolia’s “Flavor of the Month” set the standard for the company’s future product innovations such as the Sorbetes line of the 1980s, which used Philippine fruits and nuts, and the recently launched “Best of the Philippines” line, which pays tribute to different Philippine provinces and their native delicacies. Once upon a time, Magnolia joined forces with Nestlé Corporation to manufacture some of the most unique ice cream products Filipinos had ever tasted. Nestlé Non-Stop ice cream was one of them. 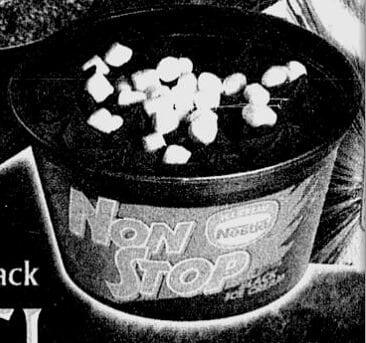 Marketed specifically to teenagers, the defunct Nestlé Non-Stop was a three-layered ice cream in a cup generously topped with marshmallows, chocolate syrup, and crushed nuts. It also came with a free wooden spoon. Some of the most memorable flavors include the Choco Banana Split and the limited-edition Black Desire ice cream (see photo above) which was used to promote the blockbuster movie Lord of the Rings: The Return of the King. Back when one peso was more than enough to buy yourself a merienda or school snack, Fress Gusto was the real deal. A bottle of this root beer soda, which only cost 25 centavos (later increased to 30 centavos), was a perfect companion for your favorite hopia. 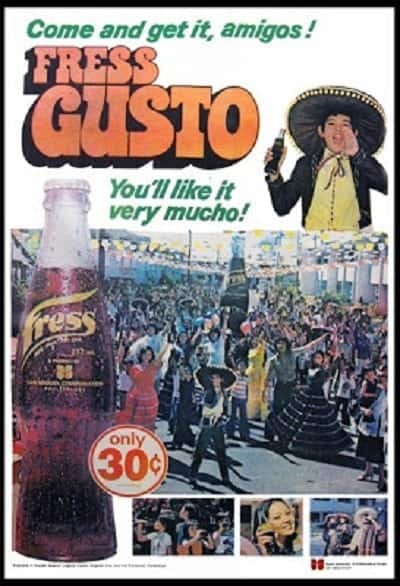 And who can forget that Mexican-inspired TV advertisement for Fress Gusto in the 1970’s? Little did we know that the young kid who popularized the tagline “You’ll like it very mucho!” would later dominate the local music industry as the one and only Gary Valenciano. We don’t consider Storck as a favorite childhood candy, but rather as an ‘adult’ candy we were once forced to eat. 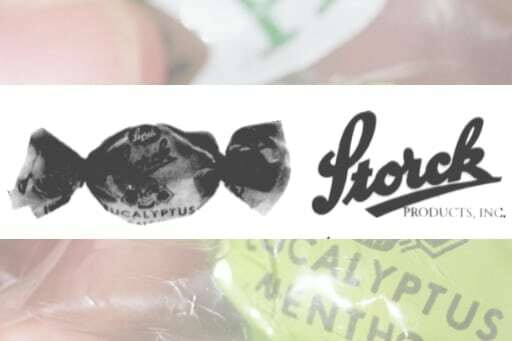 Whether as a remedy for motion sickness during a long trip or as an instant breath freshener, Storck was the menthol candy of choice back in the day. Storck outsold all its competitors, so much so that it was being exported to the U.S. by the mid-’90s. And then the unthinkable happened: the U.S. Drug Administration discovered in 1996 that the foil-like wrapper of Storck menthol candy had a high amount of lead–toxic enough to cause long-term learning and behavioral problems, among others. Storck Products Incorporated (SPI), the company behind the candy, refused to back down. With the help of a toxicologist, they let the public know that there’s no scientific evidence to prove that lead from the wrapper could be absorbed by the candy. However, the damage had already been done. Rebisco soon took over the struggling company and the Storck we once loved was renamed Starr. Nothing beats the original. And this is true with Magnolia Chocolait which came in mini glass bottles long before the company decided to put it in tetra packs. Everything about the old Chocolait screams “natural.” It was made from all-natural cow’s milk blended with high-grade chocolate. To enjoy its creamy goodness, you had to put it in the fridge for a while (or longer if you preferred it frozen). The chocolate part would settle at the bottom of the bottle so you had to shake it well before drinking. Hearing that trademark pop when opening the paper lid would signal you to start gulping it down. By the late 1960’s, Chocolait was sold at around 50 centavos. Choco-Vim, a similar yet cheaper chocolate-milk drink, cost 35 centavos. 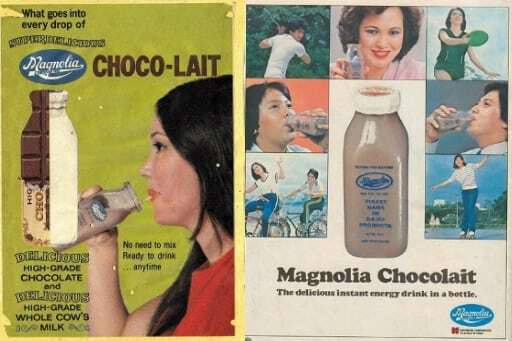 Both were manufactured by Magnolia; Chocolait was sold in square squat bottles while Choco-Vim came in straight-sided ones. The latter eventually phased out, while the former evolved and remains available to this day. 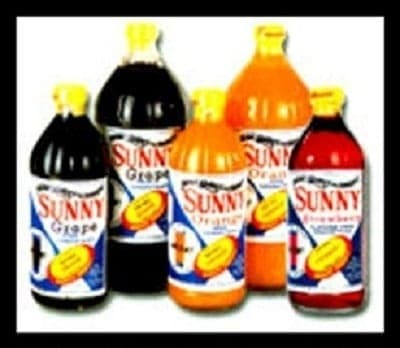 Kids who grew up in the ’80s and ’90s remember Sunny as the poor man’s fruit juice. One bottle could be diluted with water to produce several glasses of fruit juice. For this reason, it became a staple of parties and other special occasions. Schoolchildren would often bring Coleman jug containing this juice as baon. Some public school teachers, on the other hand, made sideline business out of selling this cheap thirst quencher to their students. Manufactured by Food World Inc., this defunct juice concentrate came in different flavors such as orange, grape, strawberry, and ice cola. An advertising jingle which aired in the noontime show Eat Bulaga! made the product even more memorable. But as much as we wanted Sunny to stay in the market, there was just something too ‘artificial’ about its taste. This and the rise of higher quality products that overshadowed it ultimately sent Sunny to the graveyard. 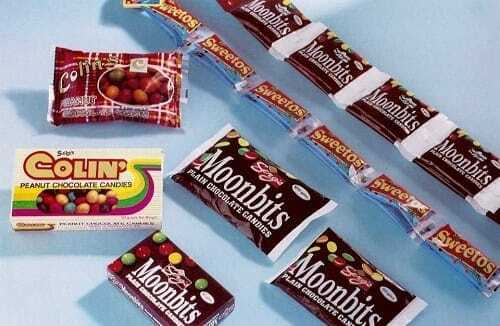 Moonbits was the forgotten Pinoy chocolate candy that once competed with Nips and M&M’s. They were button-shaped candy-coated chocolates manufactured by the defunct Filipino company Serg’s. Founded in 1954 by Anton Goquilay, Serg’s Products Inc. was named after Anton’s son, Sergio. Its unique brand of candy bars dominated the market for decades. 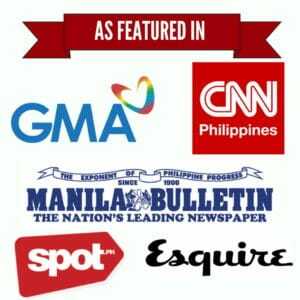 In the 1980’s, however, the growing discontent with the Marcos administration forced the Goquilays to migrate to the United States. When Sergio left his teaching job in the US and returned to the Philippines, he brought his father’s company back to life. Serg’s Chocolates once again captured the heart of the Filipino market. However, the success was short-lived. When the 1997 Asian Crisis hit the Philippines, the beloved chocolate company was not spared. Several debts and labor disputes later, Serg’s filed for bankruptcy. 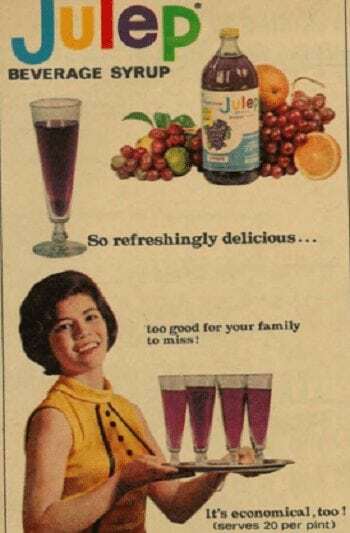 Just like Sunny, Julep entered the market when most people preferred juice concentrate over powdered form. It came in different fruity flavors, too: grape, strawberry, orange, lemon-lime, and punch. Although not much is known about when and how Julep disappeared, we can only surmise that it shared the same fate with Sunny. 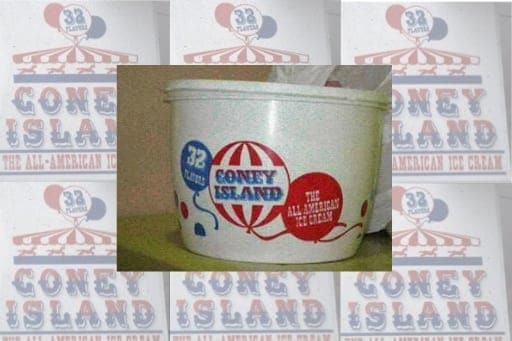 Contrary to popular belief, the Coney Island Ice Cream was an all-Filipino brand. But kids who grew up loving its incredible lineup of ice cream flavors didn’t care–they just craved for it. We’ll never forget the bubblegum-flavored ice cream with real bubblegum bits as well as New York! New York!, Pistachio, Mint Chocolate Chip, Choco Pecan Nut, and the iconic ice cream sandwich that started it all–Eskimo Roll. The carnival-themed ice cream brand was introduced to the market in the 1970’s by Seamark Enterprises, a company owned by the Trillana – De Ocampo families (the same people who gave us Whammos and Go Nuts Donuts). Seamark was later bought by Purefoods, but after a brief stint in PBA (there was, in fact, a basketball team named “Coney Island Ice Cream Stars”), the brand simply disappeared.